Its Debatable Bruh Hip-Hop & Sports Podcast (Entertainment) Episode #16 Is it Even Debatable? Its Debatable Bruh Hip-Hop & Sports Podcast (Entertainment) Episode #19 Russell Westbrook MVP! !...Is it even Debatable??? 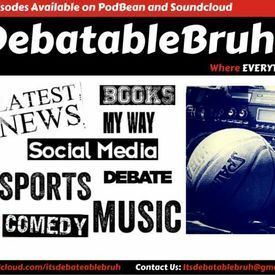 Its Debatable Bruh Hip-Hop & Sports Podcast (Entertainment) Episode #23 Is LeBron on Steroids?? I Think Not... But It's Debatable!!! Its Debatable Bruh Hip-Hop & Sports Podcast (Entertainment) Episode 15 Derrick Rose Is Still Elite!!!!!! !